Having been knocked out of the game by a cold for a while, I was sad not to be able to do very many reviews of Black Phoenix’s fragrances. I always go back to BPAL for a simple smell adventure. The fragrances might not be complex in make and mode, but they are lovely things to test and train a nose. Useless said nose is congested. So I was happy to get over this blasted virus and get back to smelling. Nothing quite like the sinus clearing Sea of Glass to harken me back to health. In Bottle: Sea of Glass is just what its name implies. It is an aquatic, sharp and strong and slightly stinging as it rockets up the nose like taking in a breath just as your head goes underwater. It settles in the nostrils and declares itself aquatic queen of the land but the queen’s got some tricks up her sleeve too. Applied: Blast of aquatics that will remain a steady theme throughout the fragrance’s lifespan. As Sea of Glass ages on the skin some more notes come up out of the foam and I get a faint whiff of light white florals dancing on the water with a gentle blend of sweet mandarin citrus and a kick of green. Sea of Glass reminds me of the color emerald and what that should smell like. Crisp, clear, and sharply clean. It has an aquatic edge to it with a subtle floral interpretation in the mid-stage. The dry down sees the fading of the aquatics and a bit more white floral representation with a sweetness that helps to smooth out the fragrance a little bit. Extra: I’ve had people liken Sea of Glass to a number of other aquatics based fragrances before. It’s been compared to Acqua di Gio on more than one occasion of which I have to disagree. Acqua di Gio has more of a sweetness to it as well as a more predominant woodsy quality. Sea of Glass is a clearer aquatic with a floral heart. 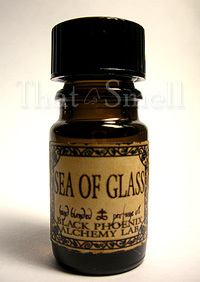 Design: Bottled in the same way as other Black Phoenix Alchemy Lab general catalog scents. It is presented in an amber colored glass bottle with a screw on cap that holds approximately 5ml of perfume oil. Notes: Aqua, mandarin, white florals, green notes. No notes listed with this one so I took my best guess at it. Sea of Glass is a nicely interesting aquatic based scent such as Bleu de Chanel. If you love that kind of stuff, give this one a try. Reviewed in This Post: Sea of Glass, 2009, 5ml Bottle. This entry was posted in black phoenix, fresh, Reviews By House and tagged aqua, green, mandarin, ozone, white flowers. Bookmark the permalink.